This Good Luck Pendant has a real genuine preserved Shamrock (3-leaf clover) captured between 2 pieces of crystal glass in a Solid Sterling Silver 925 reeded edge bezel with soldered Sterling Silver Bail for hanging on up to a 5mm chain. The pendant measures 1 inch in diameter. 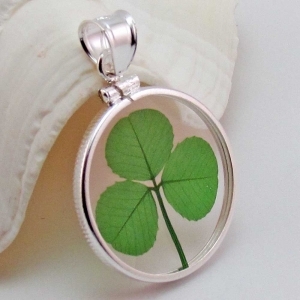 Pendant is gift boxed with a shamrock fact sheet and jewelry care sheet. Leaves symbolize the Holy Trinity: Father, Son and Holy Spirit.